DraftKings Sportsbook has been live in New Jersey for over eight months now and a lot has changed since launch, including the available promos and bonuses. Here is the current best DraftKings Sportsbook promo code and a full review of the DraftKings sports betting app. DraftKings Sportsbook is running its standard $500 first bet match signup bonus. DraftKings Sportsbook will give you a free bet equal to the amount of your first bet, up to $500. In short, only your first bet is matched and it has to be placed within 30 days of signing up. And like most other sportsbook offers, there is a play-through requirement, meaning you have to wager the winnings from the free bet. Pretty standard stuff. The fine print: First bet matched up to $500. Free bet must be used within 30 days of first bet. Free bet amount is not included in any returns or winnings. Free bet is also not redeemable for cash, non-transferable, and non-refundable. NJ only. The biggest tournament in golf is finally here and DK has some amazing boosts you won’t want to miss. We’re offering Rory to Win at 9/1 (boosted from 7/1) and Tiger to Win at 20/1 (Boosted from 14/1) plus much more. Plus check out our Tiger specials which include more than 10 special props on the GOAT! Playoff season is underway in the NHL! Check out our boosts on the best hockey of the night including a few special boosts on the showdown between Crosby and the Isles on Long Island! It’s one of the biggest days in sports. Masters. NHL Playoffs. NBA Playoffs. UFC 236. MLB. Whatever you want to bet on, DK has it and we’re celebrating this special day with what we’re calling ‘Super Saturday’. Starting at 10AM and continuing until 10PM, we’ll be unveiling a ‘super’ new odds boost each hour. Act quick though – each boost is only available for one hour! We’ve got another huge day of sports and boosts aren’t stopping. Check out our featured boosts on the best playoff and Masters action of the day plus our special parlay of the week! DraftKings is the most popular sports betting app in terms of revenue. The interface can try to do too much, but it is generally easy to navigate, with reasonable juice, and routine odds boosts along with an array of gaming options. DraftKings Sportsbook is all-around one of the best legal sports betting apps. Period. While they got some early attention for "expensive" lines, the truth is all legal sportsbooks will be slightly more expensive than the methods bettors are used to since more costs are associated with regulated entities. Their interface is not perfect, but it's clean and usable and instantly familiar to casual and experienced bettors alike. They accept all expected deposit options, like credit card and PayPal, but lack some of the more advanced methods offered by SugarHouse Sportsbook. Overall, DraftKings offers a great sports betting app, which is available for both iOS and Android. DraftKings Sportsbook is available as a web-based interface and through iOS and Android apps. While they were the first out of the gate for legal US sports betting, they now face competition from many sites, including FanDuel Sportsbook, SugarHouse Sportsbook, BetStars NJ and others. How do they stack up and what other promos and bonuses does DraftKings Sportsbook offer? Let’s take a closer look. DraftKings Sportsbook released update 2.5.0 in April in the iOS App Store. The update adds betters odds boost visibility and the ability to search for specific games. DraftKings launched DraftKings Sportsbook NJ in August 2018. It was the first sports betting app to launch in NJ. They are partnered with Resorts Casino. DraftKings says it has plans to bring DraftKings Sportsbook PA to market sometime before the start of football season. It will need to find a casino partner in Pennsylvania. PA online sports betting is yet to launch, but it will likely launch with competitors like FanDuel, SugarHouse and Parx Sportsbook beating DraftKings to the market. DraftKings continues to add to its expansive list of wagering options with the recent introduction of blackjack in its Android and iOS applications. The company indicated this is the first step in its roll out of casino-style games for DraftKings Sportsbook customers in New Jersey. As of late December, the company is testing a single blackjack game that is embedded within its existing sportsbook app. DraftKings also plans to add additional games throughout the early weeks of 2019 to provide users with a more comprehensive mobile casino gaming experience. There’s no official word yet on what the offerings may be, but most traditional online casinos include poker, roulette, and slot games. Stay tuned. The DraftKings Sportsbook, which was developed by an in-house team and said to be in the works for over a year, is a full-featured online sportsbook backed by the biggest brand in US gaming, operating under the Resorts Casino license New Jersey online sports betting. 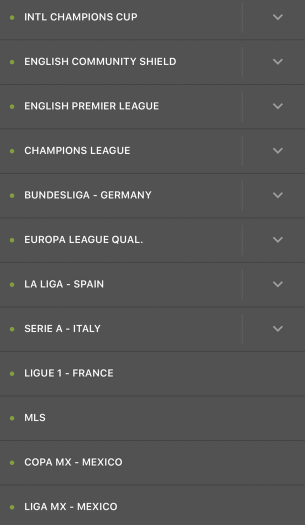 Out of the gate, DraftKings Sportsbook offers a wide, almost staggering array of sports to bet on – Super Kupa Turkey, anyone? – a clean, modern interface, and a jaw-dropping live ticket option that adds a layer of complexity (and fun) to almost every traditional bet. At the moment, DraftKings Sportsbook – or, DK SportsBook – offers team-based live betting with a significant number of in-play props and lines. Odds, which can be expressed as traditional Vegas-style odds or decimal-based figures, are, thus far, on-par with other legal sports betting operators. We recommend it as one of the top sports betting apps. Again, after listening to regulators at the East Coast Gaming Congress in Atlantic City, this location warning will likely be featured in some capacity in all online sportsbooks. The location check seems to be reliable. I was sitting at Liberty Hall in Lambertville along the border and only one time (out of around 10 attempts) did I briefly get this message before the GPS rightfully placed me in New Jersey. This sort of geo-location monitoring is our new betting overlord, and we should learn to love it. Adding funds is pretty much the same as it is with the DraftKings’ daily fantasy app— hit the plus button, choose your funding method, and get going. As for minimums and limits, DraftKings requires only a $5 initial deposit and bet minimums are under $1, so you can play on any budget level. Once funded, you’re ready to bet. Winnings are placed back into your account promptly. We’ll have more information on this as we use the app more, but unlike offshore sportsbooks, you don’t have to worry about getting your money out. Upon entering the home screen, you’re greeted by a user-friendly view of the requisite promotional banners, quick links, and available traditional bets with beginner-friendly wording like “who’s going to win?” and “who will cover the spread?” for moneyline and traditional spread bets, respectively. There’s obviously a focus on the recreational bettor from the main screen, but it makes sense for onboarding new sports bettors— DraftKings Sportsbook also offers a quick start guide. What’s more, these bets are reportedly tailored to the individual users. DraftKings will actually use your daily fantasy data and serve you up related bets. For example, if you have a DFS lineup stacked with Yankees, you might be presented with the over-under on the Yankees game on your home screen. Once you’re into the app, the options go much, much deeper and cater to the experienced bettor. This is a good approach – cater to the masses, but leave enough options for experienced gamblers – and one that DraftKings will undoubtedly refine and optimize on an ongoing basis. I’m just kidding– that’s one of six pages of soccer leagues. It’s 5 o’clock somewhere… and there’s a kickoff for you to bet on. DraftKings Sportsbook doesn’t yet offer esports betting, however. But DraftKings says it does want to offer action on more vents, including non-sports events. This is a good way to list available bets. Some other sites and offshore books feature a list-based or rigid menu approach, and we think DraftKings Sportsbook makes the best use of available space as a mobile-first platform. There’s a lot of information to impart, and they do it well, though we could occasionally do with larger fonts and buttons— users would innately know to scroll to see more options. If there’s one nitpick we have, it’s that DraftKings tries to put too much information onto the screen at once. There’s no doubt a balance to be had, and it’s something all online sports betting apps will seek to find in the early going. We dig DraftKings Sportsbooks’ “confirm bet” overlay. After choosing your intended bet, a small box slides up and gives you large-touch-target (thank you!) buttons to choose your wager amount and a big, friendly green button that says “LET’S GET IT, HOLMES!” Actually, it says “place bet,” but close enough. You also have the option to add bets for a parlay. The real growth area for mobile sports betting is prop bets and live betting, so we’re going to combine them into one section. Out of the gate, DraftKings offers your typical props (read more about props in our how to bet on sports page), but will also offer bets on DraftKings daily fantasy totals for players. That is a really, really interesting hybrid between DFS and betting and a way to bring a traditional DFS player over into a sportsbook. But the live betting is where it’s at, both for DraftKings Sportsbook and the mobile sports betting industry as a whole. DraftKings excels at it right out of the gate. In our testing, we were given live betting options for baseball to bet on things like run line, hits, totals, extra innings, and more, some on a inning basis. DraftKings says it will offer bets on whatever data is readily available, though some sports have more catching up to do in this regard— baseball, they say, lags behind some other sports with the speed of its data. But where things really get interesting is with DraftKings’ live bet ticket, which allows you to exit certain bets before their completion. They call this option “cash out.” So, if you’re winning a bet and want to lock in a profit, you can do so (albeit at a slightly lower rate), or you can exit a bet you’re losing to recoup at least a portion of it. This fundamentally changes the way you will bet on sports, point blank period. It allows bettors to hedge against themselves, protect downside risk, and also lock-in profit. Now, to be clear, sometimes the upside risk in betting is worth it. In fact, you inherently have to take risk to be successful at betting, so you’ll undoubtedly want to be judicious about using the live ticket feature. But still, it’s crazy fun and in effect turns every bet into a live bet. Really cool. One things DraftKings makes prominent in its app – we’re uncertain whether this a requirement of the DGE – is a bunch of safe play features. Player Limits: allows you to limit your deposits or spending on a day, week or month basis. Self Exclusion: allows you to literally ban yourself from using the app for a set period of time that you determine. Cool Off: allows you to prevent yourself from depositing or placing any bets for a set period of time, though you will still have access to the app. All three of these features are impressive and useful, for everyone. Industry officials are well aware that self-policing to prevent possible mis-use is necessary for legal sports betting to grow and succeed in the country. Features like this are welcome and commendable. DraftKings was established in 2012 by co-founder Jason Robbins, Matt Kalish, and Paul Liberman. Robbins remains the company’s CEO. It was part of a wave daily fantasy sites that launched after 2010 and quickly became one of the top products in the field. A year later, DraftKings received an investment from Major League Baseball. That same year they also bought Draft Street, a daily fantasy competitor, and retained some of its NY-based employees. They subsequently struck deals with other leagues, teams, and ESPN. In 2015, they received an investment from FOX Sports, Kraft Group, and others. It was at this point they, along with FanDuel, begin advertising MASSIVELY in the US and dominated sports commercial breaks. The practice caught the attention of regulators, which very much put the entire industry in doubt. As a result, in 2016, DraftKings and FanDuel struck a deal to merge, but that was abandoned in 2017 due to a series of legal issues and costs surrounding an FTC charge that the combined companies would form a monopoly. Around this time, DraftKings began building out its sportsbook technology in anticipation of legalization in the US. They became the first company to launch a sportsbook app following the Supreme Court’s decision to overturn a 1992 law that effectively banned sports wagering every but Nevada. They are now the leader in the fledgling space.